Food Habits: The gizzard shad feeds by filtering microscopic plants and animals in their gill rakers. They also filter mud and material from the bottom to obtain food matter, which is ground in the gizzard-like section of the gut. 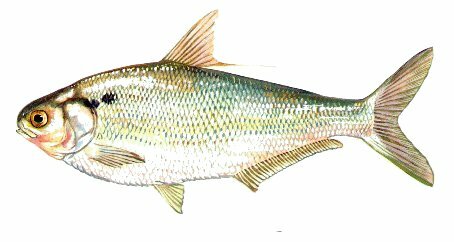 Spawning: Gizzard shad are prolific spawners with spawning peaks from May through June when up to 400,000 adhesive eggs are released to attach to various shallow water substrates until they hatch. Miscellaneous: Although the gizzard shad inhabits all of North Carolinas major freshwater rivers, streams and reservoirs, it occurs in larger numbers in the states more productive reservoirs. In reservoirs, the species congregates in schools, which use both inshore and open water habitats. Upon hatching, the emerging gizzard shad become an important food item to most game fish and continue in importance until they become too large for most species to swallow. Only large catfish can utilize most adult gizzard shad. Gizzard shad are considered to be a very poor target for anglers and are of no benefit as a food fish. Many fishermen, especially catfish and striped bass fishermen, will use gizzard shad for live or cut bait.